The ideal hardware front-end for Cubase users and a top of the range digital mixer. Comprehensive monitoring section. Clean-sounding mic preamps. DAW control. Works seamlessly with Cubase 4. Integration with non-Cubase DAWs isn't as tight. You can use the n12 in a variety of different ways. You can plug pretty much anything into the n12. 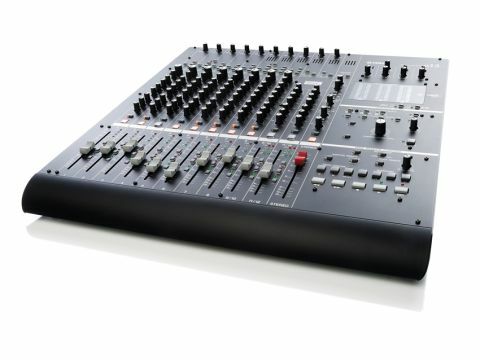 The n12 is a digital mixer, but one that Yamaha has stuffed full of features that enable it to be connected to a computer running Cubase 4 to form a formidable self-contained recording and mixing studio. As a mixer, the n12 offers 12 input channels, reverb and a comprehensive master section with foldback options, talkback and connections for several sets of speakers. It also functions as 16-channel FireWire audio interface and can serve as a controller for not only Cubase 4, but also any other DAW. The input section of the n12 comprises eight mono channels and a further two stereo channels designed for line level sources. Each of the mono channels has a mic input, a line input and an insert point. The line input on channel 8 can be switched to Hi-Z mode to take the signal directly from an electric guitar or bass. Facilities on each channel are comprehensive and include a pad switch, a hi-pass ﬁlter and phase reverse. Phantom power is switched universally for channels 1 to 4 and 5 to 8. Compression is available on each channel courtesy of Yamaha's Sweet Spot Morphing compressor - this offers ﬁve preset compression types that are designed for various common tasks. These presets are selected via a rotary knob that 'morphs' between the types for some hybrid variations in the in-between positions. A Drive knob turns up the amount of compression applied. Channel EQ takes the form of high and low shelving controls and a swept mid-range. Each channel has a dedicated reverb send plus an auxiliary send for either foldback or to access external effects. Each one is ﬁnished off with a pan control, a solo switch, a channel on switch, a smooth 100mm fader and some routing switches. To the right hand side of the unit are several clearly laid out panels that relate to all other functions. There are two headphone sockets - one fed from the aux send for musician's foldback, the other a control room feed. Up to three sets of stereo speakers or a 5.1 surround sound monitor setup can also be connected and these are selected by a set of buttons from a dedicated Control Room panel that also has talkback (the desk has an inbuilt mic), Dim and Mute switches, Level knobs and buttons to select which source is being monitored. DAW remote control is carried out from another dedicated panel with transport controls, track selection buttons and other features. As a conventional mixer, the n12 is very easy to use. Anyone familiar with an analogue mixing desk will get to grips with the channel layout and be mixing direct to stereo shortly after removing it from its packaging. Sonically, the ﬁrst thing to note about the n12 is the mic pres, which seem to be of high quality with plenty of clarity and very little noise. The compressor is a most useful tool - it enables you to quickly choose the appropriate type and amount and dial in the required sound with little fuss. The EQ is workmanlike - useful for a bit of sweetening or carving out some unwanted mid-range. Moving on to the reverb, you can choose from Hall, Room and Plate options and adjust the reverb time. It's basic, but convenient for adding a touch of ambience where it's needed. When used as a FireWire audio interface, the n12's channel outputs are recorded individually or collectively via a stereo recording buss that's accessed via the Rec routing switches on each channel. The FireWire connection is not just for recording but also for mixing, as individual DAW tracks can be routed back through the mixer channels. While users of other DAWs can set up channel routings in their software, Cubase 4 users get much tighter integration: a bunch of templates automatically sets things up for multi-channel recording. The n12's control functions, meanwhile, enable users of Steinberg's software to cutdown their mouse time considerably. Anyone who buys the n12 will be able to sample this integration for themselves, as Cubase AI4 - a cutdown version of the main app - comes in the box. The n12 is very versatile product that can be put to use in a live situation or as a front-end for any recording software. There's an immediacy to the hands-on analogue style control surface that has great beneﬁts for your workflow. It's Cubase 4 users who will beneﬁt the most from using the n12, though - the integration of hardware and software is seamless. When used together, the two products form an extremely practical recording system with a user-friendly front-end.